The Oracle Java ME Embedded release 8.1 software for the Raspberry Pi platform is a ready-to-run binary for use with an off-the-shelf Raspberry Pi Model B board. 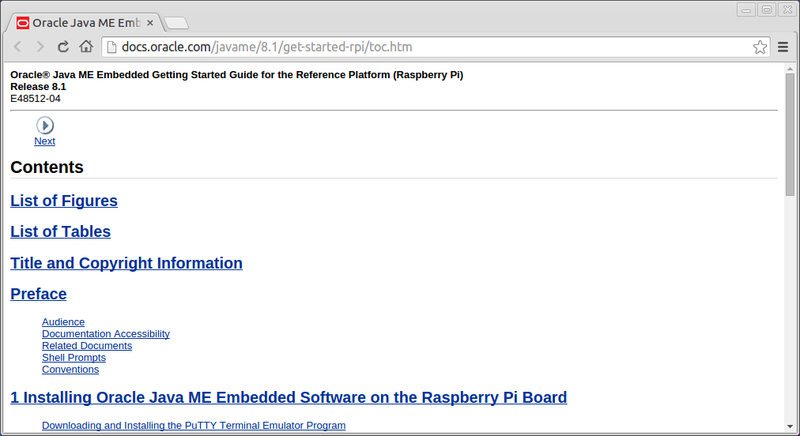 The Oracle Java ME Embedded release 8.1 software underwent sanity check for use with a Raspberry Pi Model B+ board. See the Usage Notes for more details. The Oracle Java ME Embedded software uses an optimized platform stack for small embedded devices, which includes the Connected Limited Device Configuration (CLDC) HotSpot Implementation (Java Virtual Machine) version 8, the Micro Edition Embedded Profile (MEEP) application environment, the Generic Connection Framework (GCF) API, and enhanced support for various Java Specification Requests (JSRs).